Room for market disappointment on Fed-dot shift -- The markets today will get a vague update of the Fed's ultimate goal on raising interest rates, leaving aside the current policy of "patience." The markets at the 2-day FOMC meeting that begins today will receive the first set of new Fed-dot forecasts since the FOMC at its last meeting on January 29-30 surprised the markets by dropping its guidance for higher rates and shifting to a neutral stance. The markets have convinced themselves that the Fed's rate-hike regime is over. Indeed, the market is currently discounting a 28% chance of a -25 bp rate cut by the end of 2019 and a 100% chance of that rate cut by the end of 2020, according to federal funds futures. The current Fed dots released in December, by contrast, are forecasting three rate hikes through 2020 (two in 2019 and one in 2020). The question is the extent to which Fed officials this week will cut their Fed-dot forecast for the funds rate. The markets generally expect the median Fed-dot forecast to fall to one rate hike by 2020 from the current three rate hikes, but the markets could express some disappointment if the Fed-dot forecast falls to only two rate hikes. If Fed officials generally expect two more rate hikes over the next two years, then the Fed's current rate-pause could be relatively short and certainly shorter than the markets are expecting. Wall Street economists are also more hawkish than the markets. A recent Bloomberg survey of Wall Street economists found a median forecast for one more Fed rate hike by September to 2.50-2.75%, which would then conclude the Fed's rate-hike cycle. Regarding the balance sheet, the market consensus is that there is a good chance that the FOMC this week will announce when it will halt its balance sheet reduction program, although announcements related to the balance sheet composition will be left for later. 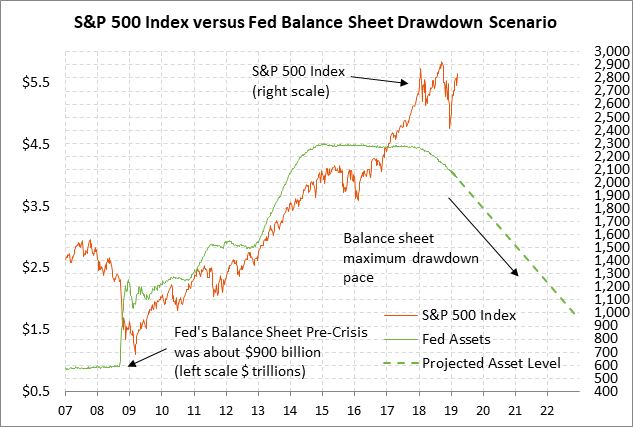 The Bloomberg survey mentioned earlier found a consensus that the Fed will halt its balance sheet drawdown program later this year in Q4 with the balance sheet at about $3.5 trillion and the bank reserve component at about $1.2 trillion. Since the Fed's reduction program began in October 2017, the Fed's balance sheet has fallen by $484 billion (-10.9%) to the current level of $3.97 trillion. The Fed is currently allowing its balance sheet to fall via the roll-off of maturing securities at a maximum rate of $50 billion per month. Chinese report says Trump-Xi meeting may be delayed until June -- The South China Morning Post on Sunday reported that a Trump-Xi summit may be postponed until June since the two sides will not be able to finalize an agreement by April. The report cited unidentified people for its sources. The report also quoted those unidentified sources as saying that there is a "divergence within the Trump administration regarding the deal with China." If true, that would suggest that the hawks and moderates are again butting heads, i.e., Lighthizer/Navarro vs Mnuchin/Kudlow. However, this time President Trump has clearly put USTR Lighthizer in charge of negotiating a deal, which means that Mr. Lighthizer is likely to win any internal battles over a final deal. For now, the markets are satisfied that U.S. and Chinese officials are all saying that progress is being made. 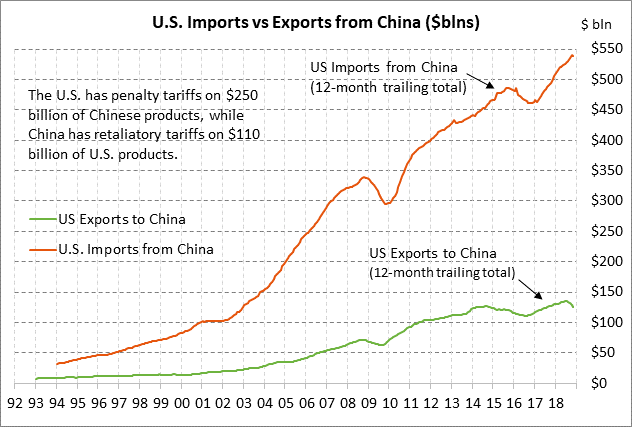 The latest such comment was White House economist Hassett's comment on Monday that the U.S. is making progress on "some of the trickiest issues," that enforcement is the "hardest thing," and that U.S. and Chinese officials are "definitively still working on it very hard." Long Brexit delay becomes more likely after Speaker Bercow nixes third Brexit vote -- Prime Minister May might not be able to hold the third Parliamentary vote on her Brexit separation agreement, which she had planned to hold today. Commons Speaker Bercow on Monday surprised the government and the markets by ruling that there cannot be another vote on essentially the same Brexit bill that was voted down last Tuesday. Mr. Bercow made the decision based on his interpretation of long-standing Parliamentary procedure. It remains unclear whether the May government will be able to come up with a workaround so that a vote can still be held before the March 29 Brexit deadline. Ms. May still has a steep climb to get Parliament to approve her Brexit bill even if she can figure out a procedural workaround to get a vote. Ms. May is trying to win over the Northern Ireland DUP party, some Brexit hardliners, and some members of the opposition Labour Party. If Parliament does not vote to approve her Brexit bill, then Ms. May said that she will go to the EU Summit on Thursday and Friday and ask for a long extension of the March 29 Brexit deadline. If that happens, then the UK will have to go back to the drawing board on Brexit, with a wide range of possible outcomes including new elections, a second public referendum, a soft or hard Brexit, or no Brexit at all. 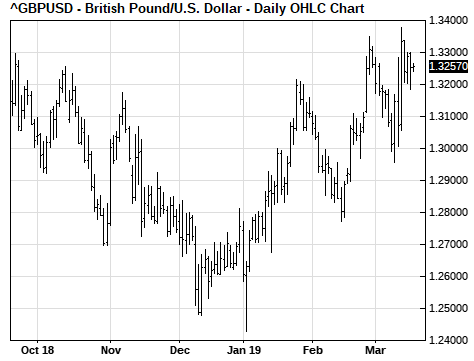 GBP/USD on Monday closed -0.26% lower on disappointment about the news that Speaker Bercow would disallow a third vote on the same Brexit bill. The odds had been improving that Ms. May might be able to squeak through on the vote. The markets would much prefer if Parliament approves Ms. May's Brexit deal, thus allowing for a quiet transition period through December 2020. The market's second choice would be a long Brexit extension, which would involve a long period of uncertainty for the UK economy but would at least remove the threat for the time being of a chaotic no-deal Brexit. Next Friday's Brexit deadline of March 29 is now only 10 days away.